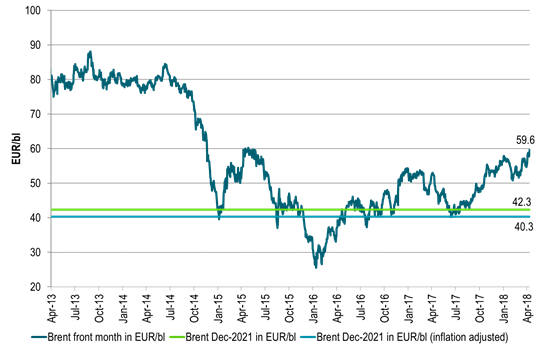 Looking at Brent crude in euro terms captures both crude oil bakcwardation, euro inflation and dollar weakening. Looking only in dollar terms then you loose the element that financial markets price the USD 11% lower vs euro over the next 3.5 years. Same actually goes for Brent crude Dec-2021 in dollar terms, but then you don’t get a reflection of markets 11% dollar softening to Dec-2021 expectation. Front month Brent in euro terms only traded below this real level during the most intense sell-off from end 2015 to early 2016. 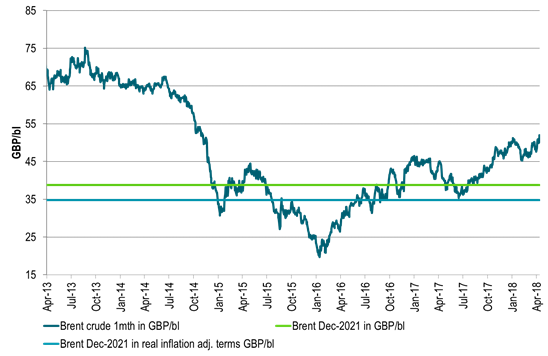 Much the same goes for Forward Brent Dec-2021 in real GBP/bl. Dirt cheap.